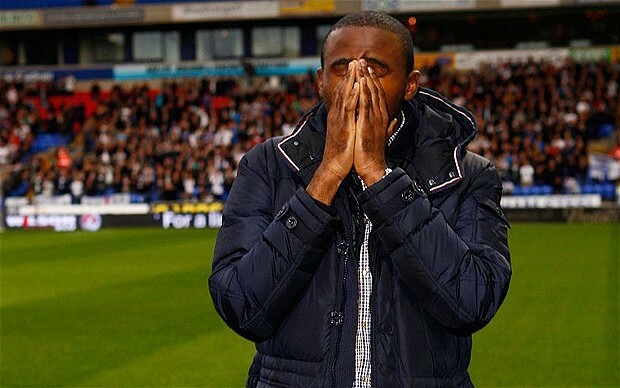 Last night (American time, two days ago for Europe I think) Fabrice Muamba stepped back on the pitch at White Hart Lane for the first time since going into cardiac arrest about a month and a half ago. Well, if you haven’t seen it, go to YouTube and watch it. I was brought to tears to see him walk out to chants of his name, a standing ovation, and 22,000 people who will now forever be able to say that they were there, the moment Fabrice Muamba walked back onto the field. I was brought to tears seeing him so emotional and it is so amazing to see a man who was technically dead for 78 minutes come back and inspire so many. So, keep inspiring, keep fighting, and most of all, thank you. Thank you for defying the odds and stepping back on White Hart Lane field. This entry was posted on May 4, 2012 by soccerblogs2014. It was filed under Uncategorized and was tagged with Bolton, EPL, Fabrice Muamba, soccer, White Hart Lane field.